It was only two summers ago when Egyptian author and Nobel laureate Naguib Mahfouz passed away, and his was a loss of the greatest of his generation. A solemn departure deeply felt by the Egyptian cultural conscience, it left a gap in the thread work of Egyptian society much like the greats who have preceded him — Oum Kalsoum, Taha Hussein, Mohamed Nagi… It’s a gap of the calibre that makes it unlikely to ever be filled again, or at least inevitably never quite in the same way that present and future generations would recall. It is on this note today that I write in commemoration of one of the greatest Egyptian filmmakers of the 20th Century, Youssef Chahine, who passed away this Sunday after having suffered cerebral hemorrhage last month (obituary to follow below). This news, though not entirely unexpected, is sadly felt indeed. Having spent so many years since early childhood greatly admiring his work (my aunt wanted to become a film director due to being so inspired by his work), the notion of Egyptian cinema without his progressive mark and impacting presence is a thing needing time to wrap one’s mind around. This also follows the passing away of the greatly esteemed scholar and historian Dr. Abdel Wahab Elmessiri this month, a family friend who I greatly respect and a truly inspirational individual. I would like to take this opportunity to honour him here, and my sincerest condolences go out to his family. May these monumental, brilliant individuals rest in peace, and may they forever be remembered through the continuation of respect, inspiration, admiration and appreciation in many eras to come. So shooting wraps on one of the boldest careers in the movies. 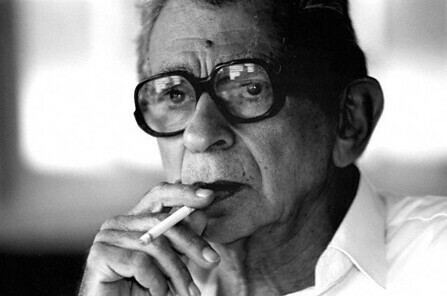 Youssef Chahine was the leading voice of the Arab cinema for over half a century – and as prolific, versatile and accomplished as many a more famous western auteur – but his abiding worth, inside Egypt and out, has been in his outspoken expression of the conscience of his country. He took on imperialism and fundamentalism alike, celebrated the liberty of body and soul, and offered himself warts and all as an emblem of his nation. Egypt’s modern history is etched in his life’s work. Chahine directed his first film, Baba Amin, in 1950, when Egypt was still a British colony. He second, Son of the Nile (1951), was invited to compete in Cannes, and over the following three decades he averaged more than a film a year, ranging from musicals and comedies to neorealist dramas, historical epics, self-portraits and a documentary. Chahine discovered Omar Sharif in a Cairo cafe, and gave him his first acting role in Blazing Sky (1953), as a peasant farm engineer fighting the injustices of a feudal landlord. Jamila, the Algerian (1958) adapted Jacques Vergès’ book about the Algerian resistance fighter Djamila Bouhired, shortly after her torture and trial by the French. Saladin (1963), a project Chahine inherited, proposed the 12th-century sultan’s defence of Jerusalem against the Christian Crusaders as an epic allegory of Nasser’s pan-Arab nationalism, though the Catholic Chahine and his leftist writers also cast Saladin as a paragon of peace and religious tolerance. Chahine’s relationship with the post-colonial authorities soon turned more critical, however. Once Upon a Time the Nile (1968-78), a documentary of the construction of the Aswan Dam, was delayed for four years by its Egyptian and Soviet sponsors after Chahine steered away from their charter of national myth-making towards a portrait of the dam’s impact on individual lives. The Choice (1970) was a murder mystery that suggested Egypt’s growing intellectual schisms in the wake of the calamitous Six Day War – a defeat for which The Sparrow (1973) laid the blame squarely on corruption in the political establishment. Sadat’s government duly banned the film for two years. Chahine’s ability to link the personal and political took another step forward with his autobiographical Alexandria quartet, named after the cosmopolitan city of his birth. Alexandria…Why? (1978) recounted the filmmaking dreams of his teenage alter ego, Yehia, amidst the ambivalently received German occupation of Cairo in 1942: while locals are kidnapping British soldiers, or promising them that “Hitler will turn you into bellydancers”, Yehia is dreaming of directing MGM musicals, and various illicit passions flare up between a Jew and a Muslim communist, Yehia’s uncle and a young British soldier. It too was widely banned. After a stress-induced sabbatical and open-heart surgery, Chahine dramatised the operation as a trial of Yehia’s life in An Egyptian Story (1982), his most Fellini-esque film: accused by his conscience of betraying his youthful idealism, he reviews relationships and career milestones against the backdrop of Egypt’s post-war metamorphoses. 1990’s Alexandria Again and Forever (1990) was a musical fantasy in which the entire Egyptian film industry goes on hunger strike for democracy; the Yehia character’s fantasies within the film about a young protege actor were Chahine’s most forthright illustration of his own bisexuality. Alexandria…New York (2004) brought Chahine’s alter ego Yehia back to America, half a century after his first visit as a wide-eyed acting student. He finds a lost son, but the promise of the American Dream, and the charm of classical Hollywood, seem sorely mislaid. His last movie, Chaos, returned to scrutinising contemporary Cairo. A burlesque about police brutality and bad education, it excoriates Egypt’s autocracy for its choke-hold on civil society, and the country’s sybaritic elite for abandoning the cause of democracy. The film was released in late 2007 – shooting was completed by Khaled Youssef, Chahine’s recent co-writer, when Chahine fell ill – and it plainly anticipates this year’s food riots. Islamic fundamentalists also feature in Chaos, but for Chahine the equation is simple: injustice is the incubator of violence. Chahine’s films have been released piecemeal on DVD in France and the US, but (with the exception of his contribution to the portmanteau movie 11’09″01 – September 11) never in Britain. They still await their wings.